Members are added to your online store automatically when customers perform an order, subscribe to your newsletter or register to your store. However, Magnet Commerce allows you to also manually add members to your e-store. For example you might want to do this when a customer has placed an order via phone. Figure: Use the "Members > Add " tab in the Administration Panel to manually add a member to your e-store. In the "Members > Add" page you will find the Member Information fields you need fill out. -Email: Enter the member's email address. This is used for sending order confirmations, newsletter etc. The member will also use this information to login to your online store. -Password: Enter the member's password. The member will use this information to login to your online store. When you have finished adding the member's details click on the "Update Customer" button to add the new member. Figure: Adding a member to your online store. Use the "Members > Add " tab in the Administration Panel to manually add a member to your e-store. Fill out the "Customer Information" fields. Also the "Company Information" fields if the member is a company and not an individual. Tick the "Receive our newsletter" box if you want the member to receive your newsletter. 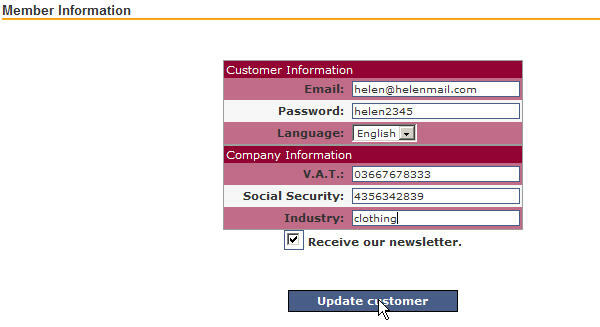 Remember to click the "Update customer" button to add the new member to your e-store.